This is one of those articles I do every now and then about how I have solved some special challenges. I have a freakishly large free-standing wardrobe from Ikea that I’m using for storage of various things; I won’t bore you with the details but it’s gigantic. In fact, I walked into it the other day, kept walking past coats, found myself in an icy wasteland with English kids and a talking lion—oh wait, wrong story... At any rate, suffice it to say that I’m using this wardrobe in such a way that it defies straightforward seismic bracing (preventing it from falling over, preventing the doors from swinging open, and preventing the contents from falling apart), and it took a while for me to figure out how to make it reasonably safe. How do I stop the massive doors from swinging open? These doors are about 7.5 feet tall, with lots of loose objects behind them. 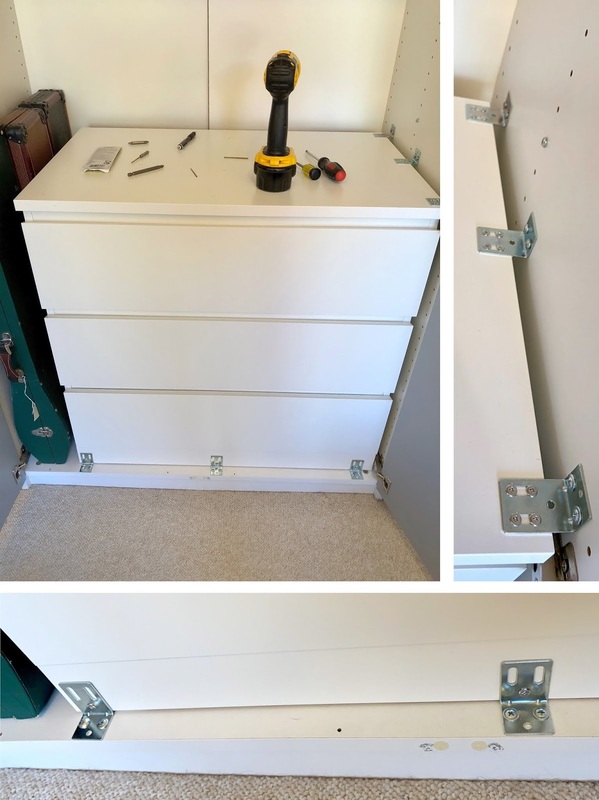 If they want to open, they aren’t likely to be thwarted by the typical quake-resistant cabinet latches like push latches and Murakoshi latches about which I’ve written. The tall doors are floppy enough that they are unlikely to be controlled by a push latch in any one place, and even the Murakoshi latch at the top would probably not be very effective. The double door is the most problematic because of all of the contents piled up behind it, so I concentrated on that section first. The first thing I did was to figure out a simple way to essentially clip the two handles together so that it would prevent the two doors from swinging open away from each other. I did not want it to be a pain to open the doors though. I tried a bunch of types of clips but they were either too inconvenient to use, or too pliable to actually hold against much force. My solution was either a stroke of alien genius or luck or a bit of both. I noticed at the hardware store a very long-shank padlock, and if I leave off the lock part and just use the shank, this hardened metal U shape easily slides over the two handles and does not bend at all. I just slip my finger under the top of the U, slide it up and off, and then drop it back into place when I close the door. I can even do it without leaving fingerprints on the mirrored doors! Why, a pre-language ape could do it! That’s great, and doesn’t look bad at all; but it’s an awful lot of pressure for a single pair of door handles to hold, so I tried adding a latch to work in concert with the clip holding the handles together. I suspect push latches just aren’t effective here, but after experimenting with those Murakoshi latches, I got a few more and added a pair to the top of these wardrobe doors. Alone, they would be ineffective, but together with the clip, I think it’s pretty secure. I used the white ones, which go better with the grey door and white back than the brown ones do. For the single door, there is nothing to clip, but there are a couple of strong shelves that won’t be going anywhere. I decided to install two brown Murakoshi latches on the same door, one at the top and one at a shelf (orange and yellow arrows) so there would be two different sections of the door being prevented from opening. It really seems to work; I can hear that comforting “thunk” sound that you get whenever you open a door with the Murakoshi latch, but I’m hearing it from two different heights simultaneously. How do I stop the contents from falling apart and out? Well, suffice it to say that I did not make matters any easier for myself by arranging the contents of the wardrobe. 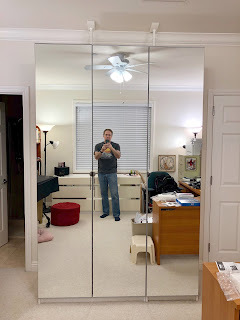 As you can see from the first photos, I have a chest of drawers INSIDE the wardrobe, some musical instruments on the chest, and a hulking shelf laden with heavy music (no, I don’t mean it’s all Mahler and Wagner, I mean that sheet music weighs a lot). I would not want the chest of drawers to topple and crash through the doors, and I wouldn’t want the shelf to collapse under the weight of the music and come down on the instruments. For the shelf, I was less concerned with the shelf itself breaking because it’s a really thick strong wooden shelf and it doesn’t seem like it is in any danger of bending or collapsing. I’d be more concerned with the little pegs holding it up on both sides, as I’ve already written about experiences with these things failing suddenly and shelves crashing down even without an earthquake. Now how about that dresser. This is holding a lot of stuff and is very heavy. It’s an Ikea dresser (yep, I put it together all by myself; took all evening but it was worth it!) and ironically, the Ikea dressers now come with kits to brace them to walls and little inserts that say you must do this to prevent little kids from climbing up the front and getting seriously injured or worse. And of course, we all brace our dressers to the wall in Earthquake Country, right? And even though it is behind closed doors that were secured as I just described earlier, a large enough earthquake could still make this dresser want to fall forward and it might just punch through the doors. But it was not practical in the wardrobe to brace the dresser to the back because that back is just flimsy backing board, not structurally sound. I ended up screwing in metal L brackets on one side and on the bottom front as pictured in the accompanying figure. Yeah I know, this is not the strongest configuration, but it was all I could do and I think that in combination with the secured doors, it will prevent the dresser from falling forward. How do I prevent this massive thing from falling over onto my head? That’s an important question because my desk is about 5 feet in front it the wardrobe; if it falls away from the wall, it’s headed right toward me! The wardrobe already had two of the cabinet straps from Quakehold/Ready America at the top, and I added a third, all in wall studs of course. Because this is so large and heavy, I didn’t just rely on the adhesive holding the fuzzy part of the Velcro strap to the top of the wardrobe; I screwed in the little short wood screws that come with some of the straps so that the assembly was more securely attached to the furniture. You can kind of see the screws in the middle photo and one is clearly shown in the righthand photo. (1) Find solid ceiling. The instructions seem to want you to find wall studs in the ceiling rather than hollow drywall; my ceiling didn’t have anything at regular intervals but there was about a foot of solid material above the ceiling right next to the wall so I was able to place them under that solid part. 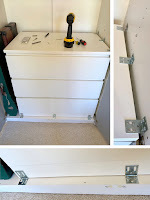 Either way, you want them bracing the back of the cabinet rather than the front, because if it tips over, the back goes up and the front goes down. (2) You are supposed to line up the different parts of the telescopic tube and screw in a sharp screw right through them, to keep the two parts at a specific length just shorter than what it needs to be. Then you turn the ring around the bottom to extend it and put pressure between the furniture and the ceiling. I do not know how tight it should be; I made it as tight as I could by hand without really cranking on it, because I don’t want it slowly cracking the drywall over time. (3) There’s a red line on the bottom tube showing where it is over-extended; you don’t want that red mark to be exposed when it is put together or it won’t be a strong.